Iran is facing a series of environmental disasters this summer, including forest fires, record heat indexes in some provinces and sandstorms threatening the capital, Tehran. Namak (Persian Salt) Lake in Qom province, which once measured 200,000 hectares, has completely dried up because of climate change, the ill-considered construction of tens of dams and depleted underground water resources. According to Seyed Ahmad Shafie, deputy director of the office of environmental protection for Qom, four centers of dust and sand with a total area of 40,000 hectares have been identified in the former lake bed. “There is no village in a radius of 50 kilometers around the lake and all plant coverage of the land has been completely destroyed,” he said. The dust and sand are threatening neighboring provinces including Tehran, he said. Salt accumulated over the years as the lake dried up is spread by the wind and is destroying the fertility of agricultural land. Seyed Rahman Daniali, the head of the environmental protection office of Qom province, has compared the crisis to that afflicting Urumieh Lake in Iran’s northwest. He says officials need to be involved at a national level and make expanding urban green spaces a priority. He blames authorities “who have done little and don’t understand the extent of the crisis” for the current dire situation. Unfortunately, the crisis in Qom province is only one of many in Iran. The situation is especially acute in the southeastern province of Sistan-Baluchestan along the Afghan border. There are ongoing efforts both at the national and international level to revive the Hamoun Lakes, trans-boundary wetlands on the Iran-Afghan border. The three lakes are linked and fed by water from Afghanistan’s Helmand River. But a combination of drought, diversion of water for irrigation, construction of four reservoirs in Sistan-Baluchistan and dykes on the border has diverted water from the Hamouns. The dried-up lakes create fine dust particles that are causing a serious public health crisis. The region’s economy has also been devastated and thousands of villagers have fled their homes. Low employment and severe poverty have led to more drug trafficking in the Hamoun region. The so-called “wind of 120 days” - a period of intense storms that start in the last month of spring and persists through the summer, has now extended to 160 days with higher velocity winds. According to Alireza Khosravi, director of the Tourism and Cultural Heritage Center in the city of Zabol, in the past people would use the120-days wind to power windmills and cool the air. However, the dried wetlands and river beds have turned the wind into sand storms. The wind that would cool the soil in the past “has turned the region into hell,” Khosravi said. The UN Environment Program has worked with Iran and Afghanistan to try to rehabilitate the Hamouns. According to Masoumeh Ebtekar, a vice president of Iran and head of its Environmental Protection Organization, authorities are revising irrigation methods and agricultural use of about 46,000 hectares of land in Sistan-Baluchistan to make farming more sustainable. Another UN organization, UNESCO, has designated the Hamoun lakes as a UNESCO biosphere reservoir. Ebtekar says other measures are being considered including new studies to discern the origin of the dust and securing international support through diplomatic exchanges for rehabilitating the Hamouns. Ebtekar also plans to hold workshops with Afghanistan and called for greater coordination between different institutions and ministries in Iran to deal with the Hamoun crisis. 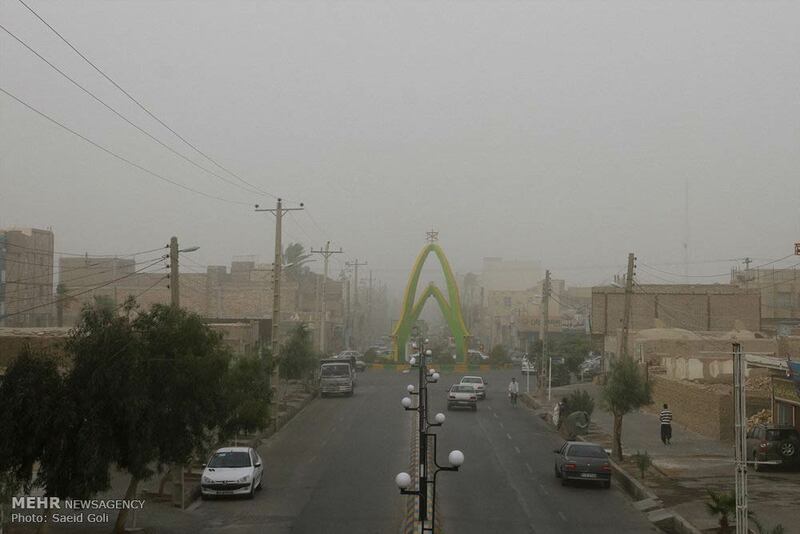 The sandstorms coincide with extremely high heat indexes in southwest Iran. In Bandar Mahshar, in Khuzistan province on the Persian Gulf, the heat index - combining temperature and humidity - rose above 140 degrees Farenheit on July 22.